"This is a delicious creamy potato salad recipe. Fresh chives add the perfect touch." Scrub potatoes (don't peel). If large, cut in half or in quarters. Boil potatoes in their skins until fork-tender. Drain, dry and cut into 1/2 inch cubes. 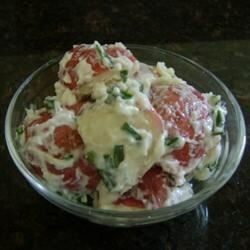 In a salad bowl, combine the potatoes, sour cream, yogurt, and chives; toss gently to coat. Add salt, and pepper to taste; refrigerate until chilled. See how to make a creamy potato salad with bacon and a perfectly firm texture. This was a very bland salad. I added a generous amount of dill weed and some bacon and it just didn't help. Sorry, I won't make it again. I added bacon bits and shredded cheddar cheese. My kids won't touch most potato salads, but LOVED this one! I used mayo in place of yogurt and added dill pickles and celery...and a generous helping of mustard cause I like it....very good! Added dill, a tbsp or so of red wine vinegar and substituted garlic salt for regular. A great healthier recipe for potato salad! Everyone liked it! My family loves this when I make it. I also add a little dill weed and some cracked black pepper. This is so good and easy! Very good salad! Easy and quick. I added a little dill pickle juice to or you could use fresh dill or dill seed. It gave it just a little kick.